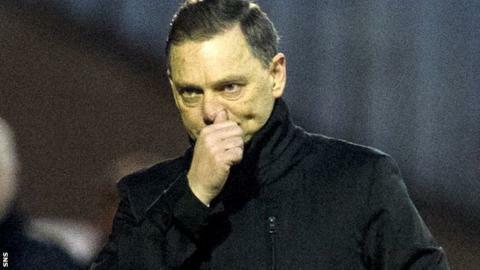 Airdrieonians chief executive Ian King has backed Eddie Wolecki-Black to return to the dugout once he has recovered from the stroke he suffered during Saturday's win at Cowdenbeath. The 50-year-old is recuperating at Edinburgh's Western General Hospital. "I've known him as a friend for over 10 years and I know how determined he is as a character," King said. "He'll be back alright. If he can come back from this quickly then Eddie will do it." Wolecki-Black was taken ill at half-time of the 3-1 victory at Central Park and taken to hospital in Kirkcaldy, before being transferred to a specialist stroke unit at the Western General Hospital. Diamonds chairman King has spent time with the former Glasgow City boss in hospital over the weekend and says he has been in good spirits. "I think it's going to be a long road back," King told BBC Scotland. "I think a lot of these things, much of the recovery is down to how fit you are and how determined you are. "One thing about Eddie, he is an unbelievable fighter. He's fought to get to where he is in coaching and he's such a terrific coach. We're delighted with the work he's doing."